Isolate pure exosome from cell culture media (supernatant). This kit yields much higher purity than exosome precipitation method. This product is for research use only. Each reaction can process 2 ~ 4 ml cell culture medium. 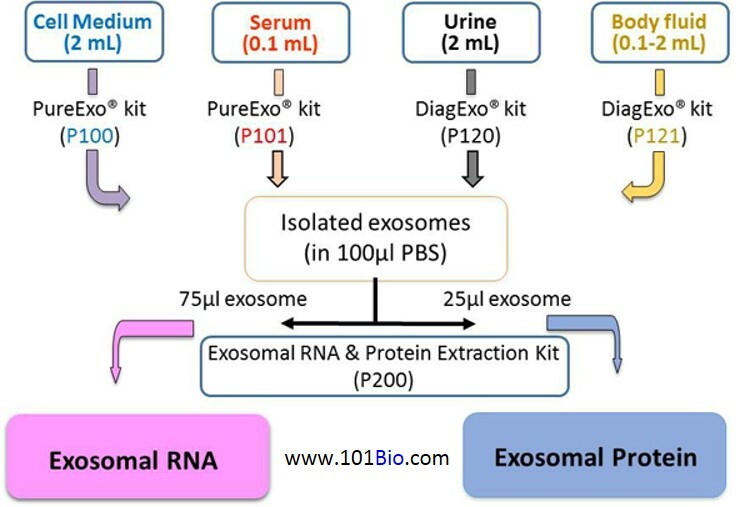 The yield of each reaction can yield pure exosome suspended in 50 ~ 200 µl PBS (from which 150 ~ 400 µg exosomal protein or 50 ~ 200 ng exosomal RNA can be extracted using our Exosomal RNA and Protein Extraction Kit, Cat.#: P200). 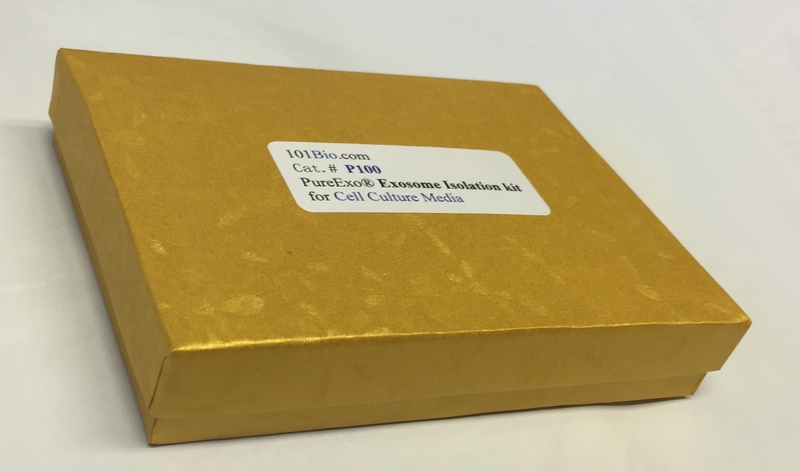 P100 kit is for exosome purification / isolation at high yield and purity from cell culture media. Use as little as 2 ml cell media to achieve high yield of exosomes for any downstream applications: EM study, exosome label, exosome subpopulation, qRT-PCR profiling of exosomal miRNAs, and gel analysis of exosomal proteins. Marędziak M, Marycz K, Lewandowski D, Siudzińska A, Śmieszek A. Static magnetic field enhances synthesis and secretion of membrane-derived microvesicles (MVs) rich in VEGF and BMP-2 in equine adipose-derived stromal cells (EqASCs)-a new approach in veterinary regenerative medicine. In Vitro Cell Dev Biol Anim. 2015 Mar;51(3):230-40. doi: 10.1007/s11626-014-9828-0. PureExo® citation from Japan distributor Cosmo indicates interesting exosome function: "exosome derived from highly metastatic SQUU-B cells conferred metastatic ability to nonmetastatic SQUU-A cells." Bonafede R, Scambi I, Peroni D, Potrich V, Boschi F, Benati D, Bonetti B, Mariotti R. Exosome derived from murine adipose-derived stromal cells: Neuroprotective effect on in vitro model of amyotrophic lateral sclerosis. Exp Cell Res. 2016 Jan 1;340(1):150-8. doi: 10.1016/j.yexcr.2015.12.009. Epub 2015 Dec 18. Zhou Y, Fang L, Yu Y, Niu J, Jiang L, Cao H, Sun Q, Zen K, Dai C, Yang J. Erythropoietin protects the tubular basement membrane by promoting the bone marrow to release extracellular vesicles containing tPA-targeting miR-144. Am J Physiol Renal Physiol. 2016 Jan 1;310(1):F27-40. doi: 10.1152/ajprenal.00303.2015. Epub 2015 Oct 14. Campbell CR, Berman AE, Weintraub NL, Tang YL. Electrical stimulation to optimize cardioprotective exosomes from cardiac stem cells. Med Hypotheses. 2016 Mar;88:6-9. doi: 10.1016/j.mehy.2015.12.022. Epub 2016 Jan 11. Kiyoshi Takahara, Masaaki Ii, Teruo Inamoto, Takatoshi Nakagawa, Naokazu Ibuki, Yuki Yoshikawa, Takuya Tsujino, Taizo Uchimoto, Kenkichi Saito, Tomoaki Takai, Naoki Tanda, Koichiro Minami, Hirofumi Uehara, Kazumasa Komura, Hajime Hirano, Hayahito Nomi, Satoshi Kiyama, Michio Asahi, and Haruhito Azuma. microRNA-145 Mediates the Inhibitory Effect of Adipose Tissue-Derived Stromal Cells on Prostate Cancer. Stem Cells Dev. 2016 Sep 1;25(17):1290-8. doi: 10.1089/scd.2016.0093. Epub 2016 Aug 18. Alice Busato, Roberta Bonafede, Pietro Bontempi, Ilaria Scambi, Lorenzo Schiaffino, Donatella Benati, Manuela Malatesta, Andrea Sbarbati, Pasquina Marzola, and Raffaella Mariotti. Magnetic resonance imaging of ultrasmall superparamagnetic iron oxide-labeled exosomes from stem cells: a new method to obtain labeled exosomes. Int J Nanomedicine. 2016; 11: 2481–2490. Donald G. Phinney and Mark F. Pittenger Concise Review: MSC-Derived Exosomes for Cell-Free Therapy. Stem Cells. 2017 Apr;35(4):851-858. doi: 10.1002/stem.2575. Epub 2017 Mar 10. Because the exosome yield of this exosome isolation kit is 10 fold higher than all other kits, you can start with only 2 mL medium. The maximum medium volume of each reaction is 4 ml from at most 5 x 105 cells. One PureExo® Column is only for one reaction. Do not exceed 4 mL medium or 5 x 105 cells to avoid indistinct layer separation and column clogging. Nanoparticle tracking analysis shows good size distribution, morphology and amount of exosome isolated by 101bio PureExo® kit.